The clean lines and maritime style of the Key Biscayne are outfitted with a blade finish reminiscent of aged Beachwood. The Weathered Zinc finish and lantern style light kit bring a coastal feel to any room of your house. The Key Biscayne also comes with a limited lifetime warranty and a patented WhisperWind motor that provides years of whisper quiet performance and worry free operation. 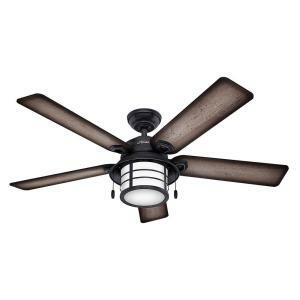 Tbook.com crawls the web to find the best prices and availability on Hunter Fanss and related Tools and Hardware products like Hunter Key Biscayne 54 inch Indoor/Outdoor Weathered Zinc Gray Ceiling Fan with Light Kit. For this page, related items include products we find that match the following keywords: "Hunter Fan" at our vendor partner Home Depot. Hunter Key Biscayne 54 inch Indoor/Outdoor Weathered Zinc Gray Ceiling Fan with Light Kit is one of 151 Hunter Fanss and related products listed in the Tools and Hardware section of Tbook.com If you have any questions on this product, please give us a call at 734-971-1210 during the hours of 9am - 5pm EST for assistance. Thank you for shopping at Tbook.com, the Internet Department Store!